The National Catholic Reporter’s Peter Feuerherd reported on the Dec. 8, 2018 Sending Ceremony in the Annunciation Chapel of the Maryknoll Sisters. Wake up, little baby God, and hear our cry! This year’s Christmas card from Maryknoll Lay Missioners connects the Nativity story with the plight of refugees worldwide. This African depiction of the Holy Family fleeing to Egypt reminds us that Jesus came into this world as a displaced person in Bethlehem, and that only days later, in order to escape from a murderous tyrant, his family had to flee to Egypt and became refugees, and that Jesus had nowhere to lay his head in Galilee. As we journey with the Holy Family to Bethlehem, we pray for all who make forced journeys. Give them strength to carry on and courage to walk the road ahead. As we hear the innkeeper say there is no room, we pray for refugees for whom there is no country. Gather them to yourself and keep them free from harm. As we contemplate that first Christmas night, we pray for those with nowhere to lay their head. Comfort them in their need and uphold them in their plight. As we listen to the cry of the infant king, we pray for children everywhere born into poverty. Wrap them in your love and uphold them in your tender mercy. As we remember the fear of the shepherds in the presence of the angels, we pray for all who are afraid to look ahead. Reassure them with your presence and embolden them to face the future. As we recall the flight of the Holy Family into Egypt, we pray for all who flee from danger. Enfold them in your care and challenge us to offer our protection. Seeds planted by Maryknoll lay missioners 40 years ago continue to bear fruit. Students in a health promoter program started 40 years ago by Maryknoll lay missioners, today continue to learn how to provide health care in the remote Petén jungle of Guatemala. Here they are practicing suturing techniques on pig skins with instruments acquired with funds raised by returned Maryknoll lay missioners. In 1977 Fay Hauer and I traveled to Guatemala to answer a call from the late Maryknoll Father Mo Healy to begin a health promoter training program in the Petén jungle. Other programs existed in the country, set up by Maryknoll sisters and other religious groups, but nothing existed in the Petén. Although we were both nurses, neither of us knew a thing about health promoters. Working with a mobile clinic, we learned first-hand what the health needs in the area were. We also started to teach health classes to the villagers. Then in late 1979, we began to teach students to become promotors of health in their villages. This course took two years, and students attended when they could find spare time from their work in the corn fields. The first class graduated in 1982. They could then treat common infections, parasites, malaria, tuberculosis and malnutrition in their aldea (village). After Fay and I left, other workers continued the program, including Maryknoll lay missioners Mary Beth Bathum and Sheila Matthews (class of 1980). 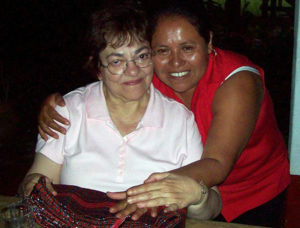 Sheila began working with Carmen Ché Chóc, a Kek’chi girl, who at age 15 had been part of our first class of promoters. A recent class of health promoters. Today this vital training program includes midwifery, natural medicine and dental care courses. 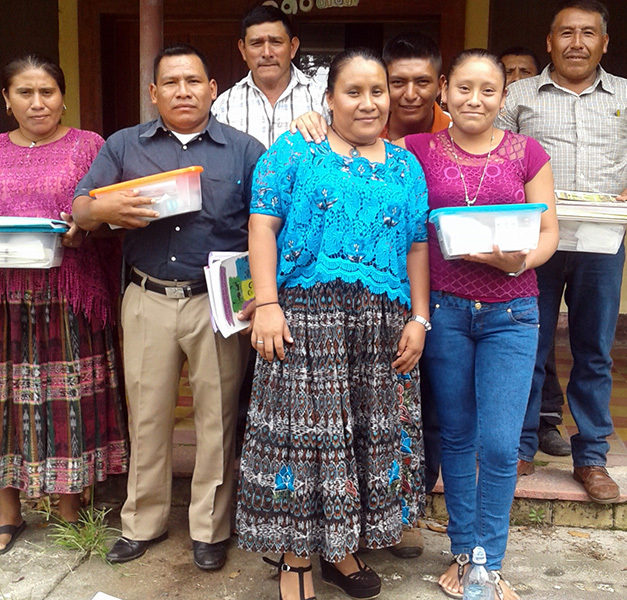 Together they expanded the program to offer classes in Kek’chi, the language of more than half of the villagers. Eventually, the program was turned over into Carmen’s capable hands. For years people came from aldeas far into the interior of the Petén where little or no medical services existed. 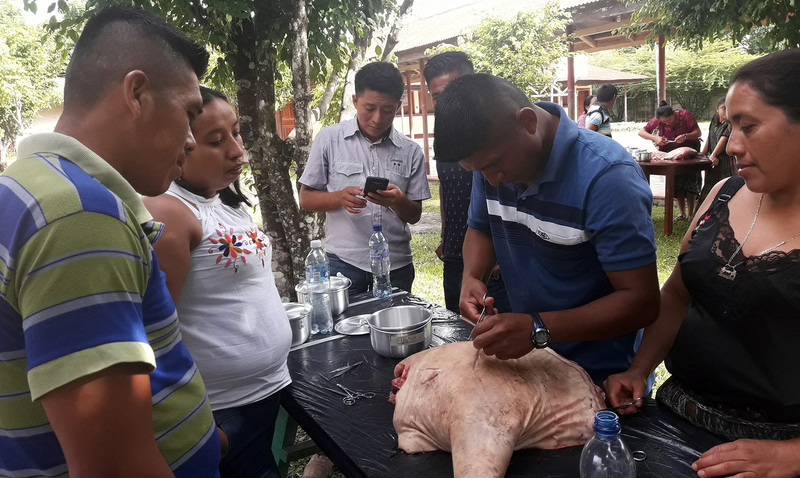 With severe lacerations, such as cuts from a machete, villagers needed to take an arduous and expensive journey to a bigger town like San Luis, Poptún or Chacté to find a doctor. Carmen therefore decided to teach the promoters suturing techniques. Unfortunately, the cost of suturing kits was prohibitive, so Carmen reached out to us for help with fundraising. With the money we raised, as well as contributions from Lin Moorman, a fellow nurse, and Bob Cashin (MKLM class of 1977–Tanzania), soon the program had enough money for five instruments and a sterilizing pan for each of the students. The students practiced suturing on pig carcasses that share some properties of human flesh. We are grateful for Carmen’s inspired leadership, vision and dedication. As of this date, 178 promotors have graduated and provide health care where little or no care previously existed. Over time, Carmen added midwifery, natural medicine and dental care courses. She helped train 22 promotors of dentistry, 16 promotors practicing herbal medicine and acupuncture, and 100 midwives. She also teaches dietary care for diabetics to help prevent complications like amputations and loss of organ function. She recently told me that the newest promoters have already begun using their suture sets. Liz Desimone served for three years as a Maryknoll lay missioner in Guatemala. She is a registered nurse and nurse practitioner and the author of Guatemala in My Blood: How Nursing In Remote Jungle Villages Revolutionized My Life (Create Space, 2009). The Catholic Post, the diocesan newspaper of the Diocese of Peoria, Illinois, features Susan Nagele’s 33-year career as Maryknoll lay missioner physician in East Africa and her current educational and advancement work from Urbana, Illinois.